Patrick and Alex talk Greg Mottola's 2009 coming of age movie Adventureland, the importance of picking the right music, manufactured nostalgia and the acting abilities of K-Stew. I liked the film too. Like many people, I didn't want to see it initially because of the marketing, but then some friends (who worked at the theater it was playing at) talked me into it. I was glad I did. Though I've only seen it the one time, I remember thinking, "This feels very similar to Freaks and Geeks" and not the standard of today's comedies with long winded improvs. One of the reasons why the time and place works so well is because 1987 was just presented--much like "Dazed and Confused." And while Alex objected to the presentation of "Compliance" without it commenting upon the incident, per say, I feel sometimes just presenting something in a way that feels 3 Dimensional makes the film experience that much more real. I felt like I was at the amusement park and not at a movie. And though I have not seen "Compliance," I have the feeling that the intent was to put the audience through all the emotions and make us question our own morals. Whether it actually earns that right remains to be seen, to me anyways. The comparison to Freaks & Geeks is a really, really accurate one. Good call. Every time someone mentions Robin Tunney, I feel the need to push the 2002 movie "Cherish," a really appealing little thriller starring her and the great Tim Blake Nelson. I like Cherish, too. I still have a tough time reconciling the second half of the movie with the first, because it starts as a different movie than how it ends. It should have made Robin Tunney a bigger star. And it features the acting debut of Liz Phair! And thankfully, the acting denouement of Liz Phair! And boy, I'm glad you mentioned The Nines. I finally caught it a month ago and was really into it; never would have thought that Ryan Reynolds and Melissa McCarthy would work together so well. So glad you dug it. I've been championing that movie for a couple of years now -- it's one of those that's really good and interesting that not enough people have seen. I don't write the "Unsung!" column, but if I did, The Nines would be one of the first movies I wrote about. Poor Robin Tunney. From her breakout role in "The Craft" through "Niagara, Niagara" to her role as a school teacher with worms in her leg (from slices of bad ham) in the pilot episode of "House", I always felt her career got short changed awfully fast. Someone should notify Robin Tunney's PR team about this comment thread. It's the most internet chatter she's received since THE MENTALIST debuted. I brought up Hollywoodland on this episode! But it was totally separate from any discussion of Robin Tunney. I cant beleive you think 'Dazed and Confused' is a masterpeice, patrick!!! Not cause im saying no it isnt, i adore 'Dazed and Confused' and it's 60's counterpart 'American Graffiti'. Both amazing coming of age tales. I would think that you would say "oh that mediocre stoner comedy" (speaking about dazed and confused). 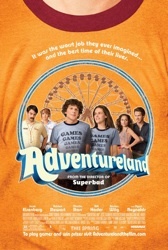 I also think 'Adventureland is really good as well and also great show! P.S - speaking of richard linklater, did you hear about 'before midnight'?, the sequel to before sunrise and before sunset. I really love before sunrise but havent seen before sunset and i was wondering what you thought of it now being a trilogy. Thanks, Anonymous! Tell us who you are! I do love Dazed & Confused. It took me a few viewings to pick up on just how good it is, but I think I was a little biased about it the first time because it had a reputation among some people in high school whose opinions I didn't really value. And we couldn't keep a copy in stock when I worked at Blockbuster -- not because it kept getting checked out, but because it would never be returned. I did hear about Before Midnight. I'm very curious about it. I wouldn't have thought I wanted a sequel to Before Sunrise, because I love where those characters are left in that movie, but I ended up loving Before Sunset, too (for different reasons). I'm worried again, though, because that movie has one of the most perfect endings of anything in the last 10 years. I'd hate to see that screwed up. But those three people (the stars & Richard Linklater) have my trust until they do something to lose it, so I remain optimistic. Ok, so really it's just the first 6 minutes and 20 seconds people should see. Thanks for finding that, Brad!